A seventeen year old from Coxhoe has made great progress in her quest to become a national singing star. Samantha Lavery is already a well known and accomplished singer in the village, performing at a range of events in the village and the region. In 2016 year she auditioned for the X Factor and provided an exceptional performance which gained her four votes and passage through to the ‘boot camp’ of this important singing competition. You can access Samantha’s initial audition here. Samantha wowed the judges yet again and was put through to the infamous ‘six chair challenge’. Samanthas initial Boot Camp performance can be accessed here. Samantha had to battle it out with other girls who have managed to get through to this part of the competition with the prize of getting through to the ‘judges houses’ stage. Unfortunately Sam failed to get a final chair on Saturday 24th September in the ‘Six Chair Challenge’ and effectively everyone thought she was therefore out of the competition. Judges thought that Samantha had chosen the wrong song for her important audition . While Simon Cowel l still offered her a chair initially there was unfortunately other people who he thought performed better on the night and they took her chair from her, seemingly ending her progress on the show. You can view her audition by clicking on this link. Then came great drama the following night on the X factor spin off show Xtra Factor where judge Louis Walsh chose Samantha for Simon Cowell as a ‘wildcard’. That means that Samantha has now qualified for the ‘Judges Houses’ stage of the competition. She is now in line for a fantastic experience with a place on the live shows. Then there was further drama when the ‘Judges Houses’ audition was broadcast on 1st October. Simon Cowell, who was being assisted by two of the Spice Girls felt he was not seeing the real Sam suggesting that she come ba ck later to complete her audition. She came back later as the ‘real Sam’ and gave an absolutely stunning performnace. As a result Simon chose her as one of the three girls he wanted to go through to the live shows. Sam performed in her first Live Show on 8th October. Her version of ‘Impossible’, by James Arthur was really well received by the judges. Simon said it was a great performance and that she had huge potential. Nicola called her the ‘Princess Warrior. Sam said she wanted to show herself. Of course her performance was sufficient to get the public to vote for her and she now goes automatically in to week two. Brilliant! Here is Sam’s performance. Sam performed brilliantly in her second Live Show on 15th October. Her song in the Motown Show, Hello by Lionel Ritchie, was really was loved by the judges. As a result she earned enough public votes to, once again, save her from the dreaded sing off in the show the following day. She returns next week to continue the Live Shows part of the Competition. You can see her performance of Hello here. A fantastic rendition of Michael Jackson’s Earth Song secured enough public votes to ensure that Sam Lavery went through to week four of the X F actor Live Shows. The song was part of the Diva week and was televised on 22nd October. Sam was the first acts to be announced as safe when the public votes were counted the following night. Check out her Earth Song performance here. 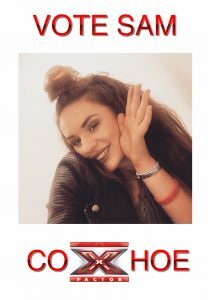 On 29th October a brilliant version of Bonny Tyler’s ‘Total Eclipse of the Heart’ on ‘Fright Night’ earned Sam enough public votes to ensure she goes through to week four of the X Factor Live Shows. Sam was one of the acts to be announced as safe when the public votes were counted the following night. What a difference a year has made as Sam has been appearing at the Coxhoe Vampire Ball in the Active Life Centre for the last three years on the same evening! This year she was at the Fountains Studios in Wembley! You can watch her performance of ‘Total Eclipse of the Heart’ here. Sam went through to the sixth live X Factor 2016 show with the ‘Lifeline’ vote. Sam sang a great version of Girls Aloud ‘I’ll stand by you’ on Saturday 5th November. Unfortunately for Sam that did not secure sufficient public votes to avoid her from being in the last three of the eight acts. However, she gained sufficient public votes to win her the lifeline and she was saved from the dreaded sing off on the show aired on 6th November. As she reached the last eight there was great news announced on the show that she would appear in the X Factor tour. A fantastic achievement for a young person from Coxhoe. Coxhoe is proud of you Sam. Check out Sam’s performance here. Sam’s journey through X Factor unfortunately came to an end when she was voted off X Factor in the sixth Live Show. Sam can feel that she has done her best and has an extremely good run. As the youngest in the competition she has had serious competition. She has had a fantastic experience and will be appearing in the Tour and her career is soaring. She released her first single in May 2017. You can keep up to date with Sam’s career progress on her own facebook and twitter accounts. Pictured below is Samantha’s family watching her original performance. Samantha dedicated her performance to her grandad who was once a singer himself.